The 400th post on this blog will involve a party for Bubbly who turned FOUR this week. Can you believe it? 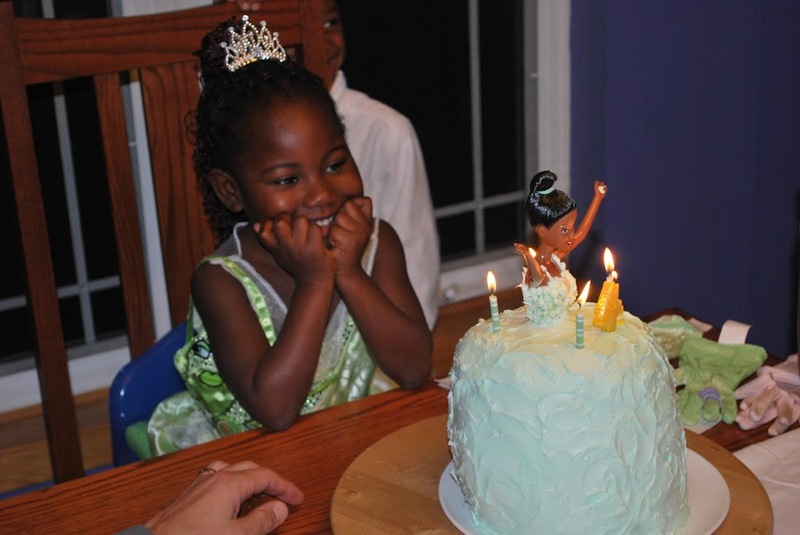 My Ghana baby is FOUR! How did that happen? We don’t have “friend” birthday parties until you’re 10 here at FullPlate Manor, then you get one “friend” party when you enter double digits. Until then, it’s family all the way. The birthday child gets to choose the venue. Usually we end up at Chu*ck E. Chee$e (oy ve). We actually broke the mould this year when Responsiboy branched out and chose bowling. I thought FOR SURE we would be headed back to the aforementioned heck-hole again when Bubbly got to choose. She surprised us all when she told me (in great detail, just like always) “I want to have a tea party, with tiny cakes where everyone wears BEAUTIFUL dresses”. Done! She hand-delivered some beautiful pink invites with a note about wearing your “best tea party finery”. My soon to be sister-in-law asked if us older girls should dig out our prom dresses. Bubbly LOVED that idea. Tiaras were purchased, fairy princess wands were gathered, and the boys dug out their Christmas ties. Last night we had high tea and then opened the floor to some major dancing. It was like a tiny Prom to celebrate what our Bubbly loves best…fancy dresses and family. Decorating with fine china while Bubbly skips through the background in her Snow White dress. FPD baked and decorated the cake. I smell a second career here. Party favors filled with tiny tea biscuits. 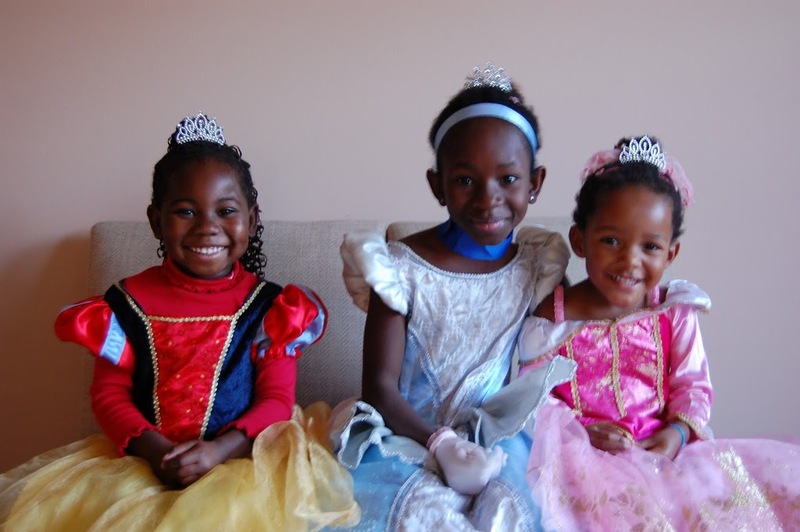 Three princesses ready for tea. Me, Bubbly and Giggles in our tiaras. Am I the only mom in the world who pulls out her opera gloves from her wedding box, her prom dress and slaps on a tiara for her four-year-old? I hope not. Tiny crustless PB&Js and mini-cream puffs at high tea. 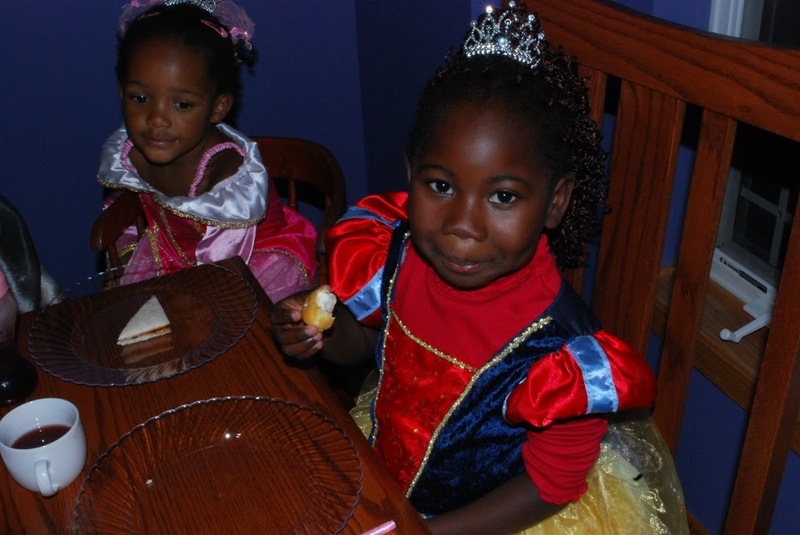 A mid-evening costume change to enjoy her princess cake. Look at Bubbly’s face in this picture! After this, we moved all the furniture in the living room and danced up a storm. There are no pictures of this, thankfully. I was bustin’ a move, and I’m sure it wasn’t a pretty sight. Anything for my girl though. 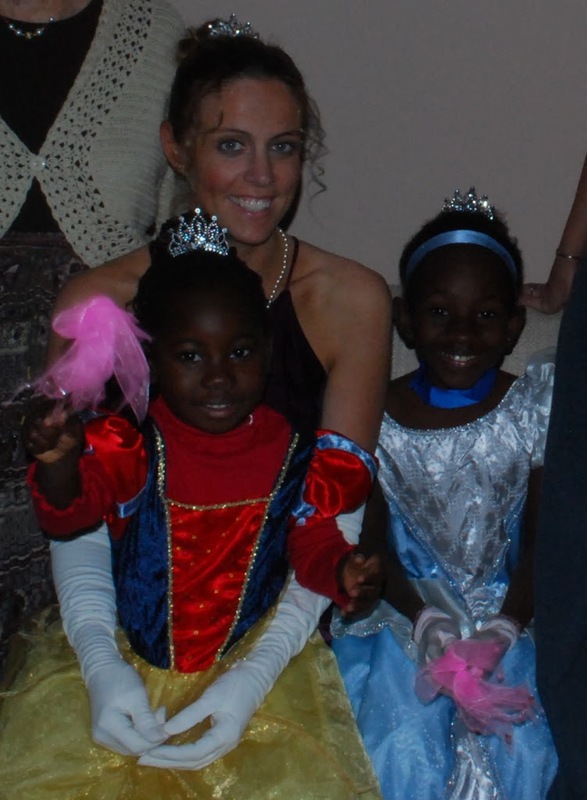 who is thankful that her Ghana baby gets to have her every wish come true. Next postOff with your head!!! Halloween 2010. Yes, dear, you are probably one of the few who still a) owns her prom dress, and, more importantly, b) still fits into it! 😀 Mine is at some vintage shop somewhere (kid you not, we went to a vintage store a few years ago and found my Prom dress there – well, not mine, but the exact same one).LOVE the party. You’re such a good mommy. 🙂 (And I’m with you on the kid party thing; we’ve kind of given up on the kid parties altogether and so when they’re younger, we all go somewhere as a family, and when they’re older they get a one-on-one outing with the parent of their choice. Andrew hung out in Chicago with me for his; Marli is going to see “Wicked” in the city with Daddy 🙂 ). If I still had my Prom dress, I would absolutely put it on for my girls! They would love it, all poofy sleeves and bubble gum pink. Ah, the 80s… I do have a fancy bridesmaid dress that would be appropriate, should I ever be invited to a High Tea party. Looks like a fabulous party, and her smiles are just the best. I can’t believe she is 4 either!